More than $1 billion disappeared from investors’ accounts today. It wasn’t because of the latest Ponzi scheme. It was because of our “big prediction” for 2011 is coming true. The culprit, as it often is, was a case of great expectations. And the costly lesson learned by many investors today can help you sidestep big losses and lead you to the largest gains in the still-heating-up-technology sector. One of the favorite top stocks to watch this year has been Netflix (NASDAQ:NFLX). Not because we like or dislike the company. The company provides a service millions of satisfied customers enjoy. We look at Netflix as a stock in a predictable and profitable cycle we’ve seen many times before. Netflix will post some blow-out results in January when it announces its latest financial results. We could see Netflix shares rise from $180 to $220, $240 or more as the positive “surprise” will turn the final non-believers into believers. That happened in late January when Netflix announced its first quarterly results. The Wall Street darling posted very strong results from the last quarter of 2010. Netflix added a record number of subscribers. Earnings were up. Margins were up. Interest in Netflix is up too. Its shares jumped from $183 yesterday to more than $210 today. Analysts are jumping over each other to upgrade their ratings. Bank of America, Morgan Keegan, Think Equity, and Pacific Crest have all upgraded Netflix. Netflix seems unbeatable at this point. And that’s’ exactly why it’s almost time for the high profit potential second half of our prediction. Following the news, shares of Netflix continued to rise. After all, Wall Street always extrapolates current trends indefinitely into the future. 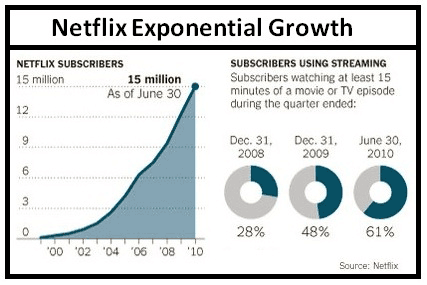 Netflix’s parabolic subscriber growth was the perfect candidate for a trend to be stretched into the future. Analysts were looking at the chart above and inputting current growth rates into their spreadsheets. They came up with price targets for Netflix between $250 and $400 in the next year or so. Given the growth rate, they made sense too. After the markets closed yesterday, however, the second half of our prediction played out as reality set in. Netflix posted another great quarter as it has done consistently for the last three years. Subscriber growth continued to soar. Netflix added more than three million new subscribers. It’s total at the end of the quarter to 23.6 million. Revenue was up 46%. Earnings climbed 86%. It was a great quarter for Netflix the company. It wasn’t so great for Netflix the stock. Netflix warned that its subscriber growth to slow in the second quarter. This should come as no surprise. It’s widely known and accepted that Internet business falls off a cliff over the spring and summer. It’s warm outside and people spend less time on the Internet. Wall Street didn’t take the “shocking” warning too well. Netflix shares closed the day down more than 9%. The downswing wiped more than $1 billion off the market value of the company. More importantly, Netflix’s recent big move up and subsequent downfall provides quite a few lessons on becoming a better investor. First, in times like these when stocks have run for two years, investors run the risk of gaining an emotional attachment to stocks. Your editor remembers warning of the potash bubble in July 2008 – a very similar set-up to Netflix. What I got was an inbox full of hate mail. Investors enjoyed the steady gains, got caught up in the “story,” and had grown emotionally attached to them. When you reach that point you knew potash and, in the current case, Netflix were poised for a quick and painful fall. Second, you can’t forget that stocks, companies, and the economy are related, but are very different. In Netflix’s case, business is booming. It added more subscribers in the last quarter than it did in its first five years of operation. The earnings and revenues showed how valuable each new subscriber is. But expectations were so high that a warning – even a warning any experienced observer would expect – would cause shares to drop tremendously. Finally, Netflix shares have done so well, the risk/reward is completely upside down. If Netflix posted absolutely stellar results, shares may have jumped 2% or 3% at best. But since they only posted great numbers, shares are down 9%. And with the uptrend broken, downside risk is even greater now. Reminding yourself of these lessons every once in a while will go a long way to helping you become a better and more successful investor.